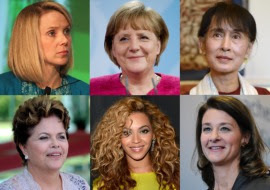 Forbes has released its list of the world's 100 most powerful women, and we're all over it. There's nothing we love more than seeing women change the world for the better, and that's practically a requirement to become one of the world's most powerful. Below, you'll find some of the most powerful women in the world, as ranked by Forbes. The new class of CEOs: Seven new CEOs seized the corner office this year—and many of them are familiar faces. Marissa Mayer, Google employee No. 20, traded her VP post at the search engine for Yahoo! Meg Whitman, former eBay CEO, is now heading up HP. And Sheri McCoy, edged out of the top job at J& J, is now at Avon. There are also the in-house promotions: Ginni Rometty at IBM, Maria das Gracas Silva Foster of Brazil’s natural gas behemoth Petrobras and Rosalind Brewer, who was promoted to the top of Sam’s Club, making her the first woman and first African American head a Wal-Mart unit. Time Inc., alternately, looked outside its Rock Center headquarters and tapped Laura Lang, former head of Digitas. Where are the women in tech? Right here.Tech is a new category to the Power Women list this year as the latest link in the power chain. Six tech women made the top 25 this year, including Facebook’s Sheryl Sandberg (No. 10), Rometty (No. 15) and Google‘s Susan Wojcicki (No. 25). There are 15 tech women in total, including also Cher Wang of HTC (No. 56) and SingTel Group CEO Chua Sock Koong (No. 74). The rising tide of female entrepreneurs: A remarkable number of women are founders or owners of their own enterprises, not a few of whose eponymous companies are synonymous with disruptive technology and innovative fashion. Consider Oprah Winfrey (No. 11), Arianna Huffington (No. 29), Diane von Furstenberg (No. 33) and Miuccia Prada (No. 67). Or Chinese real estate tycoon Zhang Xin (No. 42), Zara founder and billionaire Rosalia Mera (No. 54) and Kiran Mazumdar-Shaw, India’s first biotech entrepreneur (No. 80). The New Celebrity Role Models: Sure, they’re famous but they deserve special attention for their outside work, be it ambassadors for meaningful causes or as owners of thriving businesses. Oprah owns Harpo Productions and founded The Oprah Winfrey Leadership Academy for Girls in South Africa. Joining the efforts of the U.N. are Shakira (No. 40), Angelina Jolie (No. 66) and Gisele Bundchen (No. 83). Beyonce (No. 32) rules the House of Dereon and Sofia Vergara (No. 75) co-owns LatinWE. Jennifer Lopez (No. 38) is a multi-tiered empire unto herself. Billionaires who do more than count money:Alice Walton (No. 43) could’ve stayed in Texas and raised cutting horses, but she and her fellow billionaires are putting their 10 figure bank accounts to use in philanthropy and business pursuits. Laurene Powell-Jobs (No. 49), first-timer on the Power Women list, is the founder and chair of the Emerson Collective, a nonprofit which focuses on using entrepreneurship to advance social reform. Chan Laiwa (No. 79), like Walton, has put her focus on preserving the finest of her nation’s original art. The real news “makers”: The women on the Power Women list don’t just make headlines, they cover them. These women are responsible for shaping the international conversation. Jill Abramson (No. 5) is celebrating her first anniversary as executive editor of the New York Times while Huffington is toasting her site’s first Pulitzer Prize. Ditto Vogue’sAnna Wintour (No. 51) and her record-breaking 916-page September 2012 issue, and Fox News’ Greta Van Susteren (No. 94) for her run as the longest-serving current cable news anchor. Latinas represent: Brazil President Dilma Rouseff (No. 3), the 2012 Power Woman cover profile, shares a spot on the list with her compatriots das Gracas Silva Foster (No. 20) and Gisele Bundchen (No. 83). Here also is Argentina President Cristina Fernandez de Kirchner (No. 16), Colombia’s native daughters Sofia Vergara and Shakira, Spain’s Mera and native Nuyorican JLo. Businesswoman are booming in Asia: The whole region makes a strong showing, from China and Singapore to New Zealand and Thailand. Entrepreneurship is on the rise: see Xin Zhang, Laiwa Chan and Sun Yafang (No. 91). And Asian region women are showing their political might, from Burmese dissident and parliamentarian Aung San Suu Kyi (No. 19) to Australian PM Julia Gillard (No. 27) and Thai President Yingluck Shinawatra (No. 30). Healing, feeding and educating the world: If they’re not topping corporations or state, the women on our list are heads of major nonprofits and NGOs and they wield as large budgets and impact millions, from Melinda Gates (No. 4) and IMF chief Christine Lagarde (No. 8) to Director-General of World Health Organization Margaret Chan (No. 37), World Food ProgrammeExecutive Director Ertharin Cousin (No. 69) and Harvard University’s Drew Gilpin Faust (No. 63). 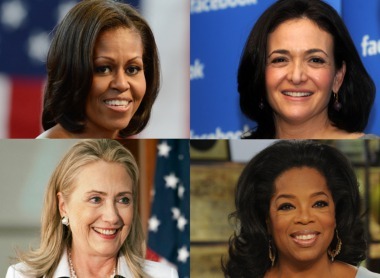 Coming to America: Many Power Woman were born overseas and found success in the States. From Huffington (Greece) and Tina Brown (U.K.) to Lagarde (France), Cher Wang (Taiwan) and Vergara (Colombia), the market and the audience of the U.S. skyrocketed their success. Social Currency: Of the 100 women on our list, almost all of them are active on social media—with a combined 90 million twitter followers. The most prolific tweeters, not surprisingly, are celebrities—Lady Gaga with 28,199,061; Shakira with 17,716022; Oprah with 13,180,843; Ellen DeGeneres with 12,842,222; and JLo with 10,239,010. In China, where Weibo is the social site of choice, entrepreneur Zhang Xin has racked up 4,118,029 on the site.